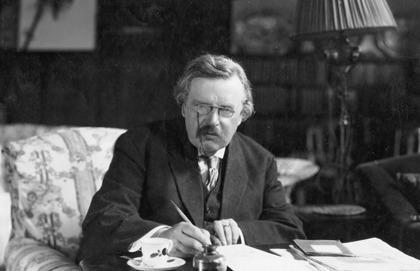 A recurring theme in the works of G.K. Chesterton is that modernity is characterized by the fragmentation of knowledge into a multitude of intellectual disciplines unrelated to one another. Because of this splintering of knowledge, modern man no longer understands who he is. As Chesterton notes in Sidelights, it is "the first facts about human nature that are now being ignored by humanity." One of those facts is that man is endowed with an immortal soul — a soul whose existence is constantly being denied. Yet, "nothing is important except the fate of the soul." • Man is an indissoluble unity of body and soul that gives him a dignity setting him apart from the rest of creation. • Human nature is nonetheless wounded by original sin. • Religion is hard-wired to human nature. • Christianity is the only religion that fills our natural need for joy. "Just as I am affected by the madman, so I am affected by the most modern thinkers. That unmistakable mood or note that I hear from Hanwell [London's lunatic asylum], I hear also from half the chairs of science and seats of learning today; and most of the mad doctors are mad doctors in more senses than one. They all have exactly that combination we have noted: the combination of an expansive and exhaustive reason with a contracted common sense." "The sane man knows that he has a touch of the beast, a touch of the devil, a touch of the saint, a touch of the citizen. Nay, the really sane man knows that he has a touch of the madman. But the materialist's world is quite simple and solid, just as the madman is quite sure he is sane. The materialist is sure that history has been simply and solely a chain of causation…. Materialists and madmen never have doubts." But the parallel between madness and materialism extends even further, since both suffer from a deep human loss: just as it was the "case against the exhaustive and logical theory of the lunatic that, right or wrong, it gradually destroyed his humanity…it is the charge against the main deductions of the materialist that, right or wrong, they gradually destroy his humanity." By explaining everything through determinism, materialists bind all human beings to a chain of causation that leaves no possibility of even saying "thank you for the mustard." To avoid this reductionist materialism, Chesterton says we must rediscover what it is that both makes the world enchanting and escapes the grasp of our senses, while acknowledging that there is in man an element of mystery, that is something indeterminate that is not susceptible to any scientifically quantifiable explanation. Man struggles at understanding himself. In Heretics, Chesterton argues that anything that passes through the human mind becomes by that very fact "a thing incurably mysterious and infinite…. All attempts, therefore, at a science of any human things…are by their nature not merely hopeless, but crazy." One thing that distinguishes man from other animals is his irrepressible tendency to express himself not only through language but also through art: "Art is the signature of man," argues Chesterton in The Everlasting Man. Modernity would have us believe that the soul does not exist because it cannot be captured by our senses. But gravity is also something that we cannot see or touch, yet no one in his right mind would dare challenge its existence. What makes the works of Chesterton so relevant to our times is that they can act as an antidote against the despair that is undermining our culture from within. We know that such a force exists through its effects, which are quite visible. The same might be said of art. We all experience it: Art is the voice of the soul. It expresses what is hidden, including what cannot be expressed in any other way. In What's Wrong With the World, Chesterton describes art as a tension arising out of man's divine origin: "While the joy of God be unlimited creation, the special joy of man is limited creation, the combination of creation and limits…. Man's pleasure, therefore, is to possess conditions, but also to be partly possessed by them; to be half-controlled by the flute he plays or by the field he digs." "A man's soul is as full of voices as a forest;…. All [sanity in] life consists in coming to the conclusion that some of those voices have authority and others not.… The only test I know by which to judge one argument or inspiration from another is ultimately this: that all the noble necessities of man talk the language of eternity. When man is doing the three or four things that he was sent on this earth to do, then he speaks like one who shall live for ever... There are in life certain immortal moments, moments that have authority." Many years ago, when our children were still young, my wife occasionally found some time to play the piano. One day, as she was playing one of Chopin's ballades, our daughter, who was then four years old, suddenly said to her, "When you play the piano, I feel like crying!" She said that because music conjures up a kind of Paradise Lost, a paradise for which we were made but that is currently inaccessible. Can anyone listen to the works of great composers and think that they are no more than "sounds pleasing to the ear," as modern philosophers tell us? We keep hearing of a "crisis of modern art." Could such a crisis possibly exist if it were not for the fact that art is the pulse of the soul? Doesn't the art that issues from our postmodern world reflect some deep dissatisfaction or despair regarding our human destiny? Chesterton insists on the fact that we are both body and soul, but he takes great care not to oppose the two. In his biography of Thomas Aquinas, having recalled that from Augustine (5th century) to Saint Bonaventure (13th century), the spirit of Christendom was primarily Platonist, he rebukes a certain Augustinian tradition for having favoured the spiritual to the detriment of the material dimension. "Augustine derived partly from Plato, and Plato was right, but not quite right." And just as any arrow not perfectly directed to its target moves farther away from its mark as it progresses, the "miscalculation of Platonism had come very near to Manichaeism." This evolution, which was more in the nature of a drift, is attributable to the fact that there is in Plato "a sort of idea that people would be better without their bodies." The great merit of Saint Thomas, says Chesterton, was his determination to study man "in his whole manhood" and to make it clear that "a man is not a man without his body, just as he is not a man without his soul." More specifically, Thomas understood that, as a result of the drift in the Augustinian tradition, there was a real risk for the Church of losing its ability to touch people's heart. The need to present the faith in a new light was becoming obvious. 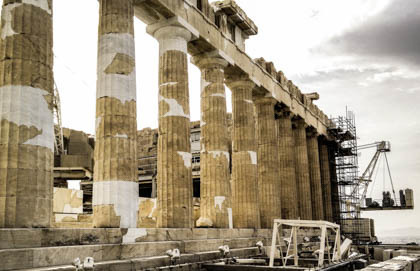 By appealing to Aristotle, Thomas "saved the human element in Christian theology, if he used for convenience certain elements in heathen philosophy. Only…the human element is also the Christian one." And what distinguishes Aristotle from Plato? It is Aristotle's understanding of the relation between body and soul. With Aristotle, body and soul constitute a unity — a human being — the soul being the form of the body rather than its prisoner. With Plato, the soul dwells in a body already formed, of which it takes charge. Man, according to Aristotle, is neither a pure spirit nor a pure animal: he is rather indivisibly animal and spirit. Augustinians understood the soul as a complete and autonomous substance and, according to Thomas, could not adequately account for the substantial union of body and soul. Properly speaking, it is neither our body that feels nor our mind that speaks. It is both simultaneously. In other words, it is the human being in its totality that feels and thinks. "The body was no longer what it was when Plato and Porphyry and the old mystics had left it for dead…. It was no longer possible for the soul to despise the senses, which had been the organs of something that was more than man. Plato might despise the flesh; but God had not despised it. The senses had truly become sanctified…. After the Incarnation had become the idea that is central in our civilization, it was inevitable that there should be a return to materialism, in the sense of the serious value of matter and the making of the body. When once Christ had risen, it was inevitable that Aristotle should rise again." By Christianizing Aristotle, Saint Thomas protected Christianity against spiritualism, which is perhaps best described as a proclivity toward abstractions. He showed that reason was in no way diminished by affirming that it is informed by the senses and that most of our thoughts are almost entirely dependent upon what we see, hear and feel. Our senses continually provide reason with "a middle field of facts" that serve as its subject matter; and in that field, reason "has a right to rule, as the representative of God in Man." In other words, recourse to Aristotle was a means not only to acquiesce fully to what is animal in man but also to elevate his animal dimension by associating it more intimately with that spiritual faculty known as reason. Chesterton thus calls on Aristotle and Saint Thomas to argue that all men are endowed with a dignity that materialism can in no way account for. But he hastens to add that this dignity must not lead us to forget that human nature is a fallen nature. While it should be clear to anyone that "the primary and fundamental part of [Thomist philosophy] is entirely the praise of Life, the praise of Being, the praise of God as the Creator of the World," it is equally clear that "everything else follows a long way after that, being conditioned by various complications like the Fall…. The Catholic mind moves upon two planes, that of the Creation and that of the Fall." "The fact that they mostly refer, more or less remotely, to the relations of the sexes illustrates the two facts that must be put at the very beginning of the record of the race. The first is the fact that original sin is really original. Not merely in theology but in history it is a thing rooted in the origins. Whatever else men have believed, they have all believed that there is something the matter with mankind. This sense of sin has made it impossible to be natural and have no clothes, just as it has made it impossible to be natural and have no laws. But above all it is to be found in that other fact, which is the father and mother of all laws.... That fact is the family." To those who claim that the doctrine of original sin derives from a pessimistic view of human nature, Chesterton replies in The Thing that, on the contrary, it is the source of a vision that is more optimistic than all modern ideologies, which understand evil as a fatality rather than a result of a deficient will. Indeed, the doctrine cuts across these ideologies by positing that, far from being caught in an evil world, we have made bad use of a good world: "It refers evil back to the wrong use of the will, and thus declares that it can eventually be righted by the right use of the will. Every other creed except that one is some form of surrender to fate." "Carlyle said that men were mostly fools. Christianity, with a surer and more reverent realism, says that they are all fools. This doctrine is sometimes called the doctrine of original sin. It may also be described as the doctrine of the equality of men. But the essential point of it is merely this, that whatever primary and far-reaching moral dangers affect any man, affect all men…. There are no wise few. Every aristocracy that has ever existed has behaved, in all essential points, exactly like a small mob." Original sin is a recurring theme in the works of Chesterton because he was convinced that its denial explains to a large extent what is wrong with the modern world. The story of the Fall "does not mean merely the story of Adam and Eve, but the highly practical and profound philosophy which teaches us that in man what is natural is not necessarily beautiful, and certainly not necessarily good." "In his new Utopia he says, for instance, that a chief point of the Utopia will be a disbelief in original sin. If he had begun with the human soul — that is, if he had begun on himself — he would have found original sin almost the first thing to be believed in. He would have found, to put the matter shortly, that a permanent possibility of selfishness arises from the mere fact of having a self, and not from any accidents of education or ill-treatment." Chesterton criticized revolutionary-minded intellectuals for their contempt of man as he truly is and for their fixation on an idyllic and abstract view of human nature. He rebelled against writers who, like George Bernard Shaw, were seduced by the Nietzschean principle of human perfectibility based on scientific and technological progress: "Mr. Shaw asks, not for a new kind of philosophy, but for a new kind of man…. Mr. Shaw cannot understand that the thing that is valuable and lovable in our eyes is man — the old beer-drinking, creed-making, fighting, failing, sensual, respectable man." "Man can be defined as an animal that makes dogmas. As he piles doctrine on doctrine and conclusion on conclusion in the formation of some tremendous scheme of philosophy and religion, he is…becoming more and more human. When he drops one doctrine after another in a refined skepticism, when he declines to tie himself to a system, when he says that he has outgrown definitions, when he says that he disbelieves in finality, when, in his own imagination, he sits as God, holding no form of creed but contemplating all, then he is by that very process sinking slowly backward into the vagueness of the vagrant animals and the unconsciousness of the grass. Trees have no dogmas. Turnips are singularly broad-minded." Chesterton was always critical of the naturalist explanations of religion that Victorian intellectuals were fond of promoting. In The Everlasting Man, he emphasized the fact that "spring and death and even dreams, considered merely as experiences… do not generate anything like a religious sense in any mind except a mind like ours." What makes that mind unique is that it can "make creeds as it could make cave-drawings." If man could see in spring and death and even dreams "the riddles and hints and hopes that he still sees in them," it can only be because "the power of religion was in the mind." He insisted on the fact that man is naturally homo religiosus: "The instinct of the human soul perceives that a fool may be permitted to praise himself, but that a wise man ought to praise God. A man who really has a head with brains in it ought to know that his head has been gratuitously clapped on top of him like a new hat." In other words, a man endowed with great powers cannot be unaware of the fact that they have been given to him and that he does not own them in his own right. That man is naturally religious is confirmed by ordinary experience, argues Chesterton in Lunacy and Letters. Most people cannot help wondering about their origin and the meaning of human existence, whether they like it or not. Any broad and realistic view of history suffices to make us realize that "nothing is ultimately more natural than supernaturalism." Indeed, "take away the supernatural, and what remains is the unnatural." When he does not adore the true God, man invents idols: "The crux and crisis is that man found it natural to worship; even natural to worship unnatural things…. He not only felt free when he bent; he actually felt taller when he bowed…. If man cannot pray, he is gagged; if he cannot kneel, he is in irons." Chesterton's views about the religious instinct help us to understand the various forms of contemporary fanaticism. Modern man, like his ancestors, cannot live without some sense of purpose: "It is precisely because an ideal is necessary to man that the man without ideals is in permanent danger of fanaticism." To all the fashionable literati who would replace traditional religions by some kind of humanism, Chesterton replies that humanism can hardly replace "super humanism," and this for a very specific reason: "The fact is this: that the modern world…is living on its Catholic capital. It is using, and using up, the truths that remain to it out of the old treasury of Christendom." Moreover, it is showing itself to be unable to start anything with real sustainability. "On the contrary, it is picking up old things that it cannot carry on at all." In Orthodoxy, Chesterton undertakes to show how the faith answers a "double spiritual need, the need for that mixture of the familiar and the unfamiliar which Christendom has rightly named romance." Our nature is such that "we need to view the world as to combine an idea of wonder and an idea of welcome. We need to be happy in this wonderland without once being merely confortable." Describing his personal philosophical and religious wanderings, he notes: "I did try to found a heresy of my own; and when I had put the last touches to it, I discovered that it was orthodoxy." At the end of Orthodoxy, Chesterton summarizes his thoughts by mentioning that what led him to accept Christianity was that "the thing has not merely told this truth or that truth, but has revealed itself as a truth-telling thing." While all other philosophies say things that appear to be true, this one "preaches an obviously unattractive idea, such as original sin; but when we wait for its results, they are pathos and brotherhood, and a thunder of laughter and pity; for only with original sin we can at once pity the beggar and distrust the king." The great paradox is that, seen from within, paganism appears much more attractive than Christianity: one has all the attractions of bodily health and freedom, while "the outer ring of Christianity is a rigid guard of ethical abnegations and professional priests." And yet, "inside that inhuman guard, you will find the old human life dancing like children and drinking wine like men; for Christianity is the only frame for pagan freedom." As for modern philosophy, "the case is opposite; it is its outer ring that is obviously artistic and emancipated; its despair is within. And its despair is this, that it does not really believe that there is any meaning in the universe." "Man is more himself, man is more manlike, when joy is the fundamental thing in him, and grief the superficial…. Yet, according to the apparent estate of man as seen by the pagan or the agnostic, this primary need of human nature can never be fulfilled. Joy ought to be expansive; but for the agnostic, it must be contracted; it must cling to one corner of the world. Grief ought to be a concentration; but for the agnostic, its desolation is spread through an unthinkable eternity…. Christianity satisfies suddenly and perfectly man's ancestral instinct for being the right way up, satisfies it supremely in this; that by its creed joy becomes something gigantic and sadness something special and small." "Rome, the legend… had stood for a heroism which was the nearest that any pagan ever came to chivalry. Rome had defended the household gods and the human decencies against the ogres of Africa and the hermaphrodite monstrosities of Greece… [But] scepticism [had] eaten away even the confident sanity of the conquerors of the world…. Man could do no more. Even the practical had become the impracticable. Standing between the pillars of his own judgment-seat, a Roman had washed his hands of the world." A few pages later, Chesterton specifies the nature of the illness that had struck at the core of the ancient world. In spite of its noble heroes, of its devotion to the city and to the State, of its martyrs and geniuses, "it was failing through its weakness in not seeing the separate soul of a man, the shrine of all mysticism." What makes the works of Chesterton so relevant to our times is that they can act as an antidote against the despair that is undermining our culture from within. To the materialists who say that the mind is nothing more than the interplay of biochemical elements in the brain, he retorts by banging on the table that we are endowed with an immortal soul. To the so-called scholars who deny original sin and reduce evil to a mere lack of scientific knowledge, he replies that human nature is wounded, but nevertheless capable of being sanctified. To the secularists who claim that religion is a crutch designed to help the dim-witted bear their afflictions, he answers that on the contrary, it is a natural instinct that God uses to reveal Himself. To those who seek the true God, he describes how he himself discovered the joy of Christian Revelation almost in spite of himself. Chesterton is all that, plus a good deal of wit and, of course, a good pint of beer!